The Kwara State Council of the Nigeria Union of Journalists (NUJ) has appealed to the workers of the three state-owned media houses, to put an end to the ongoing strike in other to allow the council intervene in the matter. 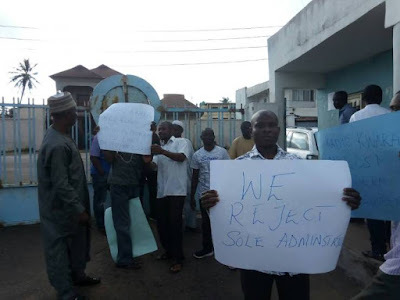 Staff of Radio Kwara, Kwara TV and The Herald newspaper had since the beginning of the week commenced strike to protest over poor working conditions. The workers are also demanding for the sack of the Sole Administrator of the media houses, Dr Muyideen Akorede. In a statement signed by the chairman and secretary of the council, Mallam Umar Abdulwahab and Deacon Omotayo Ayanda, respectively, the council said that it had resolved to set up a committee that would comprise union representatives of the three affected media establishments, and expected to follow due process in handling the matter. “The committee will intercede on their behalf by seeking audience with Governor Abdulfatah Ahmed to press home their genuine demands. “While we sympathize with our members over their plights, we are equally conscious of the fact that due process must be followed in dealing with industrial crisis so as not to put our members into avoidable situations. “The SWC wish to assure members of the union’s commitment to their welfare and safety at all time,” the statement said.